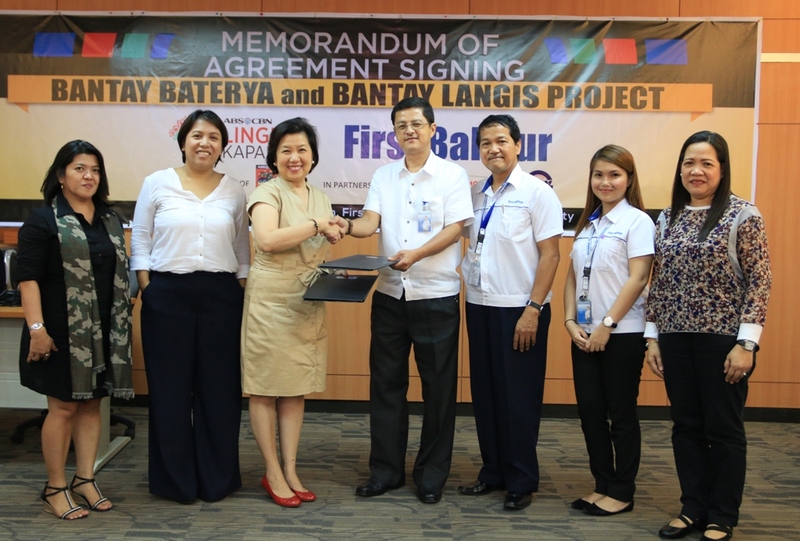 Through donating hazardous wastes such as used oils and used batteries that they produce in their operations, First Balfour commits to help in saving the environment as they tie up with Bantay Kalikasan. L-R: Jocelyn Panen - Genetron’s Pollution Control Officer, Norie Garcia – Bantay Kalikasan’s Program Director, Susan Afan – ABS-CBN Lingkod Kapamilya Foundation’s Chief Marketing Officer, Rodel Cariaga – First Balfour’s Senior Manager on Plant & Equipment Division, Rogelio Zapanta – First Balfour’s Corporate Head on Environment Safety & Health Department, Leslie Ann Jacinto – First Balfour’s Pollution Control Officer, and Rita Regalado – Oriental & Motolite Marketing Corporation’s ULAB Supervisor during the MOA Signing of Bantay Kalikasan and First Balfour. This partnership is under the Bantay Baterya and Bantay Langis project of BK where in the hazardous wastes are disposed in line with proper environmental standards through BK’s partner recyclers Genetron (for used oil) and Oriental & Motolite Marketing Corporation (for used lead acid batteries). The monetary value of the toxic wastes will be turned over to ALKFI and will be used for the operations of BK’s environmental initiatives. Through the partnership, the 30 municipalities being assisted by Bantay Kalikasan will be supported. First Balfour is known as a company that delivers world-class engineering and construction services. They have also been a partner of ALKFI on building schools and community facilities in BayaNiJuan such as the Dayap Elementary School Annex and the Livelihood & Training Center.